How to facilitate the access to land, affordable finance, and technical assistance? Which models of Community-led housing are being developed across the world? What do they have in common? 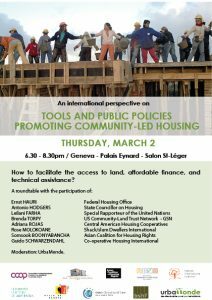 What are relevant tools and policy instruments that support Community-led Housing in different legal, economic and social contexts? What are the main achievements, challenges and bottlenecks that inhabitant groups are facing in the Global North and South? How can policy-makers contribute to enabling community-driven habitat initiatives at different levels? Rose Molokoane is the National Chairperson of the 80,000-member South African Homeless People’s Federation and their national savings coordinator, and a Board Member of Shack/Slum Dwellers International (SDI), a network of community-based federations in 33 countries across Asia, Africa and Latin America. A veteran of the anti-apartheid struggle, she is one of the most internationally recognized grassroots activists involved in land tenure and housing issues. Her involvement in the sector stems directly from her personal experience. She has spent more than 20 years organizing urban poor communities, helping them to pool savings and obtain land and housing. Molokoane is also a prominent member of Urban Poor Fund International, the first global fund to give poor people direct control over development spending in cities. Somsook Boonyabancha is the Secretary General of the Asian Coalition for Housing Rights (ACHR), a coalition of organizations working on housing development for the urban poor in Asia. Formerly, she was the Director of the Community Organizations Development Institute (CODI) in Thailand. For the past 30 years, Boonyabancha has worked on housing development for the urban poor and slum upgrading in Thailand and other Asian countries. Her expertise is community-driven and community-led development, disaster rehabilitation, community welfare, urban and rural community land and housing development. During her years at CODI, she carried out a national urban community upgrade plan that has been implemented in almost 300 cities in Thailand today. She graduated from the Faculty of Architecture at Chulalongkorn University in Thailand and from the Housing and Urbanization Course in Copenhagen, Denmark. Guido Schwarzendahl is a board member of Co-operative Housing International (CHI), an umbrella organization for cooperative housing worldwide, since 2013 and currently vice-president. His primary interest, focus and drive has always been social housing and specifically co-operative housing. In 1994 Guido obtained a post in a housing-cooperative in Halle, Germany, and has been managing director since 2001. The Bauverein Halle-Leuna e.V. has nearly 8,000 flats and more than 17,000 occupants. Following the success of the housing cooperative, Guido was invited to be a member on the evaluation committee for adjusting the local housing markets of the federal building ministry of Germany in 2007 and 2008 and again in 2014 up to 2016. Brenda Torpy has more than 30 years of experience in the affordable housing field. As the first Housing Director for the City of Burlington, Torpy led the development of the Burlington Community Land Trust (CLT), now Champlain Housing Trust (CHT), and served as the founding Board President. In 1991, she joined the staff as Executive Director. Torpy was a Ford Foundation Leader for a Changing World in 2002. She was President of the National Community Land Trust Network (NCLTN) and now is part of the Board of Directors of the newly founded Grounded Solutions Network (GSN). She serves on the Governor’s Housing Council of Vermont, the Federal Reserve Bank of Boston’s Community Development Committee and the Federal Home Loan Bank of Boston’s Affordable Housing Program Advisory Committee. Adriana Rojas Ugalde is a Costa Rican sociologist, graduated from the University of Costa Rica. She is member of the self-help and collective property Housing Cooperative COOVIFUDAM R.L., which is the first of this type in the country and coordinates the process of the approuval of a draft law on mutual help Housing Cooperatives, currently being discussed in the Legislative Chamber. Adriana is a delegate to the Central American Coordination of Solidary Housing (COCEAVIS), a political space gathering 67 housing cooperatives and member of the working group on Social production of habitat promoted by HIC. Isobel Ashford joined BSHF as Head of Communications in 2012 and became Deputy Director in 2015. She oversees the development and delivery of BSHF’s programmes and communications. Isobel initially trained to be a teacher and worked in the UK and Italy before spending seven years in the Spanish Basque Country. On returning to the UK she retrained in marketing and managed communications in several public and not-for- profit organisations before joining BSHF.